Sciblogs | Curbing alcohol advertising – where’s the evidence? Curbing alcohol advertising – where’s the evidence? I’ll excerpt from my submission to the Ministerial Forum on Alcohol Advertising and Sponsorship of a couple of years ago; the whole thing is here. They were focused on evidence since 2010 because they took the Law Commission’s prior report as starting point, so that explains the ‘since 2010’ bits quoted below. Nelson (2010) examines whether alcohol advertising bans affected alcohol consumption in a panel of 17 OECD countries over the years 1975-2000. His modelling is careful: he begins by controlling for the underlying factors giving rise to country-level restrictions on alcohol advertising before estimating the effects of those restrictions controlling for the underlying factors that cause advertising restrictions and controlling for the overall stringency of alcohol regulation. He finds that bans on alcohol advertising have no effect on total alcohol consumption. It is rather important to correct, as he does, for the underlying factors that predict countries’ adoption of advertising restrictions: Gallet and Andres (2011) demonstrate that countries with a greater proportion of youths, with greater life expectancy, with higher income, and with greater Muslim populations are more likely to adopt advertising restrictions. If countries that are generally healthier, as demonstrated by life expectancy, are more likely to adopt restrictions on alcohol advertising, correlations between health outcomes and advertising bans could easily be spurious. Nelson also notes that while, from the 1980s onward, most countries liberalised their restrictions on alcohol advertising the period since the 1980s has also seen reasonable declines in total alcohol consumption. Similarly, the period of liberalisation in New Zealand, from 1989 onwards, also corresponds with a period of substantial decline in per capita consumption. Morgenstern et al (2011) finds that German students who were better able to recall the names of alcohol brands from popular advertisements had a higher risk of drinking and of binge drinking. However, they are unable to demonstrate a temporal effect: that is to say, they cannot demonstrate whether advertising recognition preceded drinking, or came subsequent to drinking. Consequently, they cannot tell us whether students most able to recall alcohol brands are 2.3 times as likely to engage in binge drinking as those least able to recall alcohol brands, or whether students who binge drink are 2.3 times as likely to remember alcohol brands. As they also measure exposure to non-alcohol advertising, it would have been interesting to see if, for example, students who take on more duties at home were better able to recall the detergent brand, whether students with mobile phones were better able to remember the T-Mobile brand, and whether students who go hiking were more able to recall the trekking-clothing ads. 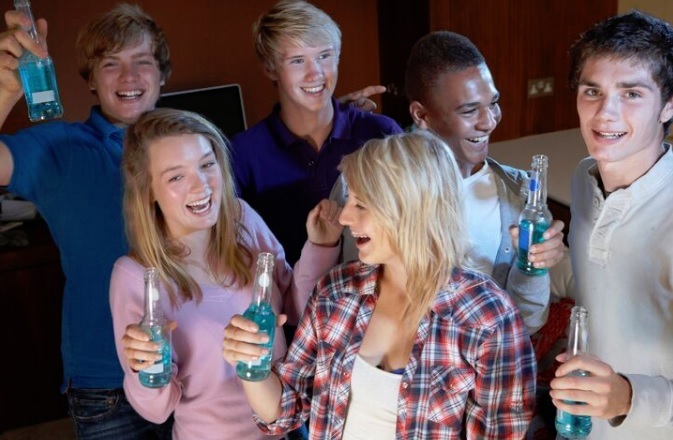 Jones et al (2011) argue that youths who indicated having seen alcohol advertisements were more likely to initiate drinking and to have consumed alcohol in the past four weeks. However, their adjusted odds ratios frequently fail to achieve statistical significance. One significant effect was that having seen TV advertisements for alcohol halved the risk of having consumed alcohol in the past 12 months. But none of the odds ratios there reported should be taken particularly seriously: the substantial reduction in odds ratios after correcting for a very small number of covariates, coupled with the substantial decline in statistical significance after such correction, suggests that uncontrolled confounding could easily explain the remaining variation. Table 3 presents correlations between advertising and alcohol initiation across 32 different advertising / gender / age cohorts. They find three associations are significant at the 5% level: barely more than we would expect by sheer chance with so many separate regressions. Results in Tables 4 and 5 are rather similar: where adjusted odds ratios are significant, three show that alcohol advertising reduces the likelihood of regular or recent alcohol consumption, seven show an increased risk, and 42 show no significant relationship whatsoever. If anything, we should take this study as providing reasonably strong evidence of the absence of a relationship between having seen alcohol advertising and the initiation of alcohol consumption. Further, while some of the aggregates presented in Table 2 provide statistically significant associations between some alcohol advertising exposure and drinking, they are unable to rule out reverse causality where those who are more interested in alcohol to begin with are more likely to pay attention to and to remember alcohol advertisements. Look past their discussion of their results to what they’ve actually shown: there is scant evidence on which to hang their conclusions. I couldn’t see much reason to expect that advertising bans in sport would do much to reduce risky drinking. I also didn’t like suggestions of bans on sponsored events, teams and venues. Bans on alcohol industry sponsorship of sporting or other events need be based on strong evidence of net harms resulting from such sponsorship. If youths or other at-risk groups were substantially more likely to engage in harmful binge drinking instances because their favourite team or concert were sponsored by particular brands, and if those harms greatly outweighed the demonstrable benefits of sponsorship to the sponsored organisations and events, then we could have a reasonable case for restrictions or bans. That evidence, however, does not exist. While there is ample evidence of alcohol sponsorship of events and sports teams, evidence of consequent harms is lacking.Further, it is plainly evident that attendees at sponsored events often greatly benefit from that sponsorship. The Rugby Sevens are typically taken as evidence of the awful consequences of alcohol sponsorship of sporting events. And while it’s true that the Sevens are typically associated with alcohol consumption, that hardly makes the case for a ban. Survey data from the HPA (2013) demonstrates not only broad awareness of alcohol sponsorship of the Sevens, but that alcohol’s presence at the Sevens is a critical part of the fan experience. 82% of attendees surveyed at the Sevens agreed or strongly agreed that drinking alcohol made the event more entertaining; 93% agreed or strongly agreed that they attend the Sevens because of the atmosphere; 77% agreed or strongly agreed that “drinking alcohol at this event is ‘just what you do’”. Fans attending the Sevens really seem strongly to enjoy the particular atmosphere present at the Sevens. It’s also worth noting that that same survey demonstrated that alcoholic sponsor messaging was less prominent there than at other surveyed events, like the Heineken Open or the International T20, where alcohol sponsor messaging was more prominent but where the event’s culture was rather more sober. UPDATE: I’d forgotten to link the Cochrane Review, that said there’s not enough evidence to show anything on effects of advertising bans as yet. Curiously, none of the Science Media Centre’s chosen experts seemed to have heard of that one, ’cause they didn’t cite it. I share your opinion that any ban should be based on hard evidence provided by gathered data and not the assumptions. The source of certain behavior, especially on group events like sports games is in the culture. Eric, I am curious. Presumably, businesses spend huge amounts of money advertising because it increases sales. I would expect a large set of evidence for this. The small list of citations you give would seem to contradict this; suggesting that reducing advertising has little impact on sales. Strange. Alcohol marketing is generally aimed at increasing brand loyalty and increasing brand share relative to competitors. It’s a mature market. Think about car advertising. It’s not particularly likely that car advertising increases the number of cars bought, but does affect how people think about the different brands when they’re making their purchase decisions. Mature market. I agree that part of the marketing has a brand loyalty/market share objective. However, it also has a “best alternative” objective – choose a beer over a soft drink for example. Maybe this is “wider market” – share of beverage sales vs share of beer sales, but the nett effect is the same. It shifts sales toward to the advertised product. I suspect that the advertising makes a difference at the margins of market growth (well behind price considerations), but then problem drinking is a marginal activity and is relatively immune to price signals as I understand it. Given that understanding, I don’t see a ban on advertising as a realistic response to youth problem drinking. You may (and should) correct me if I am wrong!